Graco is the trusted name in baby products. Now, the company has entrusted MyRegistry.com to power its online gift registry service. "It only makes sense for Graco to give its customers the ability to create a registry right on the company's website." For over 60 years, the Graco brand has provided trustworthy, thoughtful, and expert parenting solutions to generations of families. With a heritage of innovation designed around the best intentions of loving parents, they know that the smallest things can make the biggest difference. Now, Graco is taking a step further with its new online universal baby registry service, powered by MyRegistry.com. 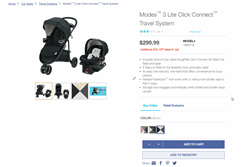 Visitors to Gracobaby.com can quickly and easily create a universal baby registry to which they can add any Graco product, including car seats and travel systems, strollers, playards, bassinets, highchairs, and swings, without leaving the site. To get started, visitors simply have to fill out a quick form on Graco’s gift registry home page. Or, they can click the ‘ADD TO REGISTRY’ button beneath any product. Once one or more gifts have been added, the registry can be managed, edited, and shared with family and friends via MyRegistry.com. Those purchasing the gifts are seamlessly directed back to Gracobaby.com to complete the registry purchase. According to an NPD study, dollar sales for U.S. durable juvenile products top $6 billion, and Graco is the leader in the baby gear category, which represents nearly one-third of overall industry sales. Given these figures, it’s clear parents (and parents-to-be) are intensely devoted to the brand, so it only makes sense for Graco to make it simple for them to start a baby registry right on their site. Graco, part of Newell Brand’s strong portfolio of well-known brands, is an innovator of baby and children’s products that provide solutions to help parents make smart choices while taking care of their little ones. For over 60 years, Graco has built trusted, quality and helpful products including car seats, strollers, travel systems, swings, highchairs, playards and nursery care essentials.